Forged in the fires of social activism and musical passion, OZOMATLI is one of the west coast's greatest musical treasures. Their unique blend of Latin rhythms like cumbia and salsa, hip-hop, jazz and funk has made them a staple of festivals around the world, but surprisingly never the Victoria Ska & Reggae Festival. But that all changes in 2018 as these west coast titans finally bring their high-energy, phenomenally engaging stage show back to Victoria's Inner Harbour. 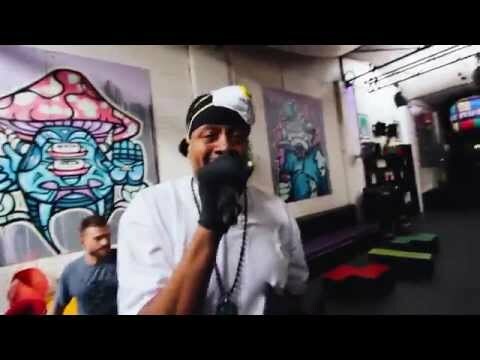 They'll be joined by longtime friend and collaborator, Chali 2na. A founding member of both Ozomatli and the mighty Jurassic 5, 2na brings an electric stage presence and obviously deep love of music wherever he goes. From west coasts legends to a Jamaican titan, Freddie Mcgregor, one of reggae music's most legendary and enduring vocalists will be gracing our main stage for the first time this night as well. The voice behind some of reggae's best-known tracks like "Big Ship" and "Just Don't Want To Be Lonely," McGregor has been treating ears to his otherworldly voice since he started recording for the legendary Studio One when he was just seven years old. A reggae legend under the Victoria sunset before an Ozo dance party...honestly, what could be better? Well, maybe a little bit of hip-hop history to add some street flavour. The Ready to Rock Crew is one of hip-hop's most legendary crews, tending the pillars of hip-hop - DJing, MCing, B-boying and graffiti - since 1982. The crew has grown and morphed over the years, with chapters popping up in Paris and Toronto, as hip-hop has only increased in relevance and influence over time. The homie QUE ROCK reflects the aesthetic of his adopted crew, working hard in all areas of hip-hop culture. Infusing the hip-hop culture he loves with his elements of his traditional Anishnawbe values, Que Rock has created something completely unique in the world of hip-hop and we're so proud to present his work on our stage for the first time. Rounding out this genre-smashing party are two close friends of the Victoria Ska & Reggae Festival, GANJO BASSMAN and TANK GYAL. Recently landed to the west coast from Mexico, songwriter/vocalist/producer Ganjo Bassman has quickly made a name for himself with his signature "rock-reggae-hop." The mix of grunge guitars, popping basslines and hip-hop beats, all wrapped up in a reggae aesthetic has been quickly winning over our Island Massive, including a highlight performance opening for Bermuda legend Collie Buddz this past December. And what would a Ska & Reggae Festival be without the mighty Tank Gyal? Creator of Vancouver's infamous "Thursday Ting" and one of the most knowledgable DJs around, Tank Gyal is a Vancouver reggae institution unto herself. She'll be holding it down, keeping it groovy in between sets with the finest in dancehall/reggae/dub tunes.